I’ve got another picnic recipe for you today! Hey! I forewarned you that I was in a picnic mood. I can’t stop. I won’t stop. I promise I’ll bake something this weekend. I promise. It’s supposed to rain anyway, and if there’s anything that helps in getting rid of those rainy day blues, it’s anything sweet and baked. Any-who, I wanted to do something special with the delicious cider I received from Tieton Cider Works. I was so in love with their Yakima Dry-Hopped Cider, that I knew I had to cook with it. This is the dish I came up with. This salad is perfect for a picnic. It’s perfect served warm, at room temperature or chilled…AND…it’s great anytime of day. 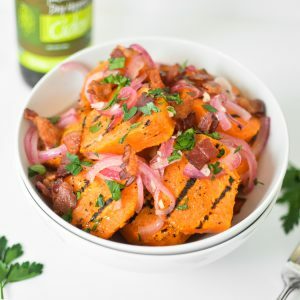 This salad contains sweet potatoes that have been grilled to perfection, and then topped with bacon and pickled onions. The vinaigrette is made from the cider and the match couldn’t be more perfect. Recipe is below, along with some thoughts on this DELISH cider, so read ahead! Description: If you are a beer lover, who rarely goes over to the “cider-side,” this cider is for you. I mean, I feel like the “dry-hopped” aspect of this cider, should give it away. I’ve never had a cider like this before. I love anything dry: wine, beer, cider … you name it. This cider is a lovely blend of sweet and slight bitter notes. It’s just great…so great in fact that I am distraught that it’s all gone. I hate it when that happens! I added it to the vinaigrette in this sweet potato salad (and it was AMAZING), and decided to pair with it as well. It gives the salad the perfect little kick, and it also enhances the spiciness from the jalapeño. It’s great all around, so give it a go! This grilled sweet potato salad is perfect for your next picnic. The sweet potatoes are grilled to perfection and then topped with a light vinaigrette! Bring a large pot of salted water to a boil. Add the sweet potatoes and boil until just tender, but not soft, about 10 minutes. Drain and cool. Preheat your grill to high. While your potatoes are cooling and your grill is heating up, prepare the rest of your ingredients. In a large saute pan, cook the bacon over medium heat, until just crispy, about 8 minutes. Remove the bacon with a slotted spoon and transfer to a paper towel-lined plate. Add the onions to the saute pan, and cook for 2-3 minutes. Lower the heat, and add the jalapeño and garlic. Cook for another minute. With the heat still set on low, add the olive oil, cider, vinegar, sugar and a dash of salt and pepper. Whisk to combine. Cook for 5-6 minutes or until the onions begin to turn a pinkish color (this means they are starting to pickle). Remove from heat and set aside. Once your potatoes are cool enough to handle, place them in a medium bowl with the canola oil, cayenne pepper, and a generous amount of salt and pepper. Toss carefully to combine. Grill your sweet potatoes for about 3 minutes on each side or until you get nice charred grill marks. Remove from heat. Place your sweet potatoes on your serving platter and top with the bacon and pickled onion mixture. Sprinkle the parsley on top. Serve warm, at room temperature or chilled! Enjoy! Ok this looks delicious! I love love sweet potatoes and squash so this is right up my alley! Beautiful, colorful pictures as always. Thank you so much, Micheline! Do you drain the bacon grease before adding the rest of the ingredients? Hi Heather, Honestly it is totally up to you. If you are talking about draining before you add the onion, then I suggest adding some other fat (maybe a tablespoon of olive oil). If you want to saute the onions in the bacon fat, but don’t want it in the actual “dressing,” then you can try to drain it before you add in the rest of the ingredients. Either way will work fine. I’m a bacon freak, so I tend to like that added flavor, but if it’s too much, drain away! I hope this helps! This sweet potato salad is so BEAUTIFUL Justine! Was excited to read the recipe after you posted this on instagram. What a perfect picnic dish. Keep them coming! Thank you so much, Natalie! I agree, I think it’s perfect for a picnic ;). I hope you are having a wonderful week!